Hilal Conferences and Exhibitions (HCE) recently launched its campaigns for a string of events it will hold in 2016, namely Gulf Industry Fair, iTECH Industry Forum and Exhibition, gulfBID, gulfInteriors and Gulf Property Show. The launch highlighted new features that HCE has introduced to promote and stage its exhibitions in the New Year. “Our Virtual Exhibition provides added-value 12 month extra exposure to a global audience. Visitors to the exhibition’s site can see a video tour of each company and its product range and also access the company’s e-profiles We’re adding to this unique feature a fun element – select your guide for the exhibition tour,” revealed Ahmed Suleiman, exhibitions director of HCE. In addition, HCE launched a strong programme of parallel conferences and workshops running along Gulf Industry Fair and iTECH Industry Forum and Exhibition. All events will be held at the Bahrain International Exhibition Centre. Gulf Industry Fair (GIF): The GCC’s exclusive annual industrial promotion showcase is scheduled to take place from February 9–11. GIF provides a unique ‘one-stop-shop’ approach for the elements of industrial development across the sectors of aluminium, energy and environmental protection, industrial metals, industrial processes and manufacturing, logistics and industrial facilities, industrial security and safety, ports and maritime industries as well as training for industry. A highlight of GIF is the Aluminium Zone. A 2016 sponsor for GIF, Alba will encourage the growth of the downstream aluminium sector. The world’s fifth largest aluminium smelter recently announced the start on its Potline 6 expansion project. The new production line will turn Alba into the world›s largest single-site smelter plant and provide more metal to the region’s manufacturers utilising aluminium. Also supporting GIF are Bapco and the National Oil and Gas Authority, who recognise the invaluable contribution required from national energy companies to industrial growth. 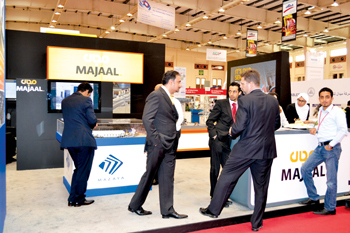 Majaal Warehouse and Company, Bahrain’s SME-focused developer and operator of industrial facilities is also a solid supporter of industrial facilities for industrial diversity. iTECH Fair: Scheduled to take place from February 9–11, iTECH Industry Forum and Exhibition will be leading the way to promoting industrial innovation from the IT sector directly to industry at Gulf Industry Fair. The iTECH Industry event provides direct access for the IT sector to target customers involved in diverse industries. “iTECH Industry provides a gateway for companies in finding products relating to data security, disaster recovery, privacy, web mining, advanced imaging, sensing technologies, supply chain optimisation, industrial engineering advanced design, robotic, cloud computing and artificial intelligence uses,” said Abdulrahman. The iTECH Industry Awards 2016 will feature awards for: Best Use of Cloud, Women in IT, Best Software Solutions Provider, I-Achievers, I-Entrepreneur, Big Data and Analytics Solutions and Security Enablers. gulfInteriors: Set to run from April 26–28, gulfInteriors is a platform for architects, interior designers, importers and dealers to network and market their products. “The show experiences the unique advantage from other exhibitions in the region because it takes place alongside two other major exhibitions, namely Gulf Property Show and gulfBID. The three constitute the only integrated B2B and B2C platforms for the construction, interior and property sectors in the Northern Gulf,” said Abdulrahman. gulfInteriors 2015 hosted a range of designs and products manufactured from Bahrain, Saudi Arabia, Germany and Italy among other markets, taking advantage of 7,200 unique visitors attending the three shows. The event has the strategic sponsorship of Kuwaiti Manager Building Materials & Equipment, a subsidiary of Kuwaiti Manager Holding Company (KMC), and Hempel Paints, a global supplier of quality paints. Gulf Property Show: Taking place alongside gulfBID and gulfInteriors, Gulf Property Show showcases commercial and residential real estate developments in Bahrain, the GCC region, Turkey, the USA, UK, and Europe to a targeted audience of investors. “Gulf Property Show is a trusted window to the GCC›s real estate and property development industry. 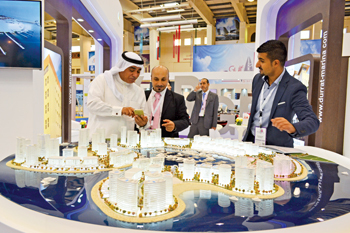 Bahrain’s financial and real estate regulatory framework is a contributory factor to the success of the show in attracting the kingdom’s leading developers to showcase and launch current and future developments,” said Abdulrahman. With months to go before the opening, as much as 60 per cent of exhibition space has been sold and there are strong enquiries from Bahrain and overseas for the remaining spaces, said Suleiman. Gulf Property Show 2016 carries with it the strategic sponsorship of Diyaar Al Muharraq and Manara Developments and the support of the Bahrain property Developers Association (BaPDA). gulfBID: Now in its ninth edition, gulfBID has strategically provided companies across the GCC access and exposure to Bahrain’s sought-after construction industry. 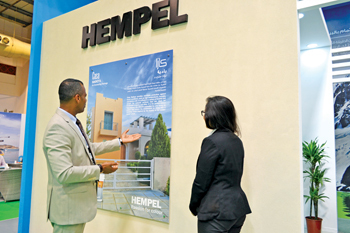 The event, happening alongside Gulf Property Show and gulfInteriors, will take place from April 26–28. 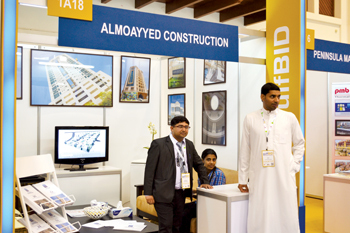 “Leading GCC companies involved in the construction sector such as Manar Al Omran, Al Rezayat Protective Coating, Gulf Scaffolding Co, Al Dweik Factory, Plastbau Arabia Co, and Bonar Natpet utilised the market opportunity made available at gulfBID 2015. We see in 2016 major opportunities for companies to increase their sales and market presence through gulfBID 2016” commented Abdulrahman. The event has the strategic sponsorship support of Haji Hassan and KMC Holdings. Best Stands: HCE announced the winners of their Best Stand Awards for gulfBID, gulfInteriors and Gulf Property Show held in May 2015. The winners were Al Nooh Wood Design for gulfBID, Hempel Paints for gulfInteriors and Eagles Hills for Gulf Property Show.